The Pioneer PDP-5010FD Plasma is a current Fall 2007 model. This plasma TV is assembled in the U.S. with components manufactured in Japan and the U.S. Pioneer focuses their manufacturing efforts on top performing plasma televisions. Up conversion from 480i and 480p: Up conversion using our trusty, old and poorly produced Risky Business DVD was very good. There was slight grain and background noise but from 14 feet it was almost unnoticeable. There is a slight flicker when viewing the plasma from up close. The realism was excellent and I thought the Pioneer’s video chip sets cleaned up the picture nicely while staying true to the original content. Reds really popped, and this was a facet of the original production. 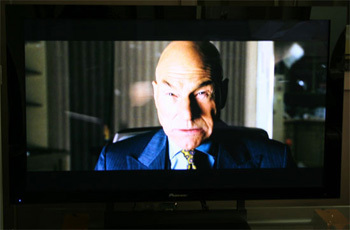 720p/1080i/1080p Picture Quality: We reviewed The Last Stand next in the X-Men’s epic line of comic thrillers produced in 2.40: widescreen letterbox format. It’s hard to imagine that television picture quality is going to get any better than this. In 1080i and 1080p the Pioneer 5010FD performed almost flawlessly with stunning clarity, deep rich blacks, vibrant but not oversaturated colors. The post calibrated picture will seem at first softer than normal but you the viewer will enjoy the picture much more over time (and you wont get a headache from all the false edge enhancement). False Contouring/ Mapping: Historically a problem with both plasma and LCD technology. It’s non-existent on this plasma. Price Considerations: $3999 is hefty for a 50” flat screen television these days. 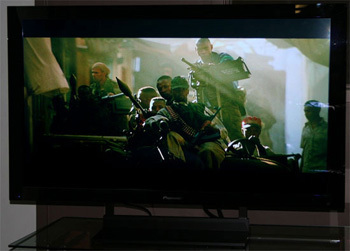 Of course, it has the highest super HDTV resolution 1080p. It has a fantastic, thus far unparalleled picture. Review Equipment Used: Sony Blu Ray BDP-S1 High Definition DVD player, Sony DVP-S50 DVD player, JVC HM-DH40000U HD Video Cassette player, Sencore Color Pro 5000, Sencore Auto Cal Pro, Sencore signal generator.